The switches are equipped with a fixed set short-circuit release (own protection) and correspond to UL 489/CSA 22.2 No 5.1 regulation. 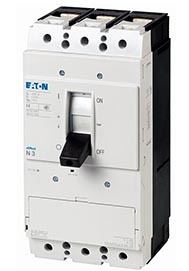 Also the switches are tested to IEC/EN 60947-2 as circuit-breakers without overload protection (CBI-X) main-switch characteristics according to IEC/EN 60204 and isolating characteristics according to IEC 60947. For current heat loss per pole at Iu the following applies: details refer to the maximum nominal current of the frame size.